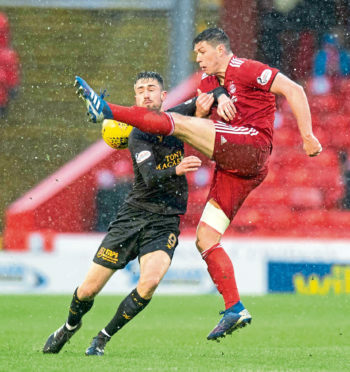 Aberdeen manager Derek McInnes doubts defender Scott McKenna will be fit for Scotland’s game with Kazakhstan on Thursday. McKenna played through a thigh injury in the 1-1 draw with Livingston, and the Dons boss has spoken to national team coach Alex McLeish about his involvement. Scotland face the Kazakhs in Astana before playing San Marino three days later, which McKenna may stand a better chance of being fit for. The Dons centre-back has quickly established himself as a regular in the national set-up after making his debut against Costa Rica last year. He is due to travel with club captain Graeme Shinnie for the opening Euro 2020 qualifiers. McInnes said: “If he does travel I’m not sure he will be fit for the first game. We’ve got to be sensible – the game might just come too quick. You take into account a few things: the tightness of the thigh, the travelling and the AstroTurf pitch. “I’m not a medical expert so I wouldn’t want to rule him out, but having spoken to the physios they would have a concern with him being fit. I think he would be fit for Sunday but it would be touch-and-go for Thursday,” he said. The Dons could do with the 22-year-old coming through the international period unscathed, given the rest McInnes already needs to give to recuperating players. McInnes plans to rest Greg Stewart for the next seven to 10 days to allow his hip problem to settle, while Connor McLennan was pulled out of the Scotland under-21 squad with a knee issue. Niall McGinn, who scored in the 1-1 draw with Livingston, is away with Northern Ireland for their home games against Estonia and Belarus. McInnes added: “With Considine failing a fitness test on his calf, Scott had to go in with his thigh heavily bandaged.